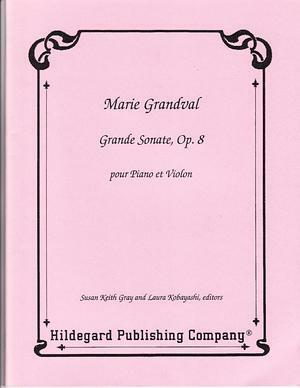 Marie Grandval (1830-1907) studied composition with Camille Saint-Saëns and piano with Chopin. In 1890, she received the prestigious Prix Chartier for chamber music from the Paris Conservatoire. Her instrumental chamber works include duos with piano for flute, violin, cello, English horn, oboe, and clarinet, and various trios. She composed songs, several successfully-premiered operas, choral works, symphonies and symphonic works, and many transcriptions of her own works for one piano, four-hands and two pianos. The Grande Sonate, Op. 8 for Violin and Piano seems to be an early work, according to the opus number, but the dates of neither the composition nor the publication are known.